In this collection, Ferrante and Teicher demonstrate that they are expert and sensitive pianists, as well as inventive innovators. Here they abandon their exploits with prepared pianos — plucked strings, tacked hammers, whacking the lid — to present twelve favorite songs with suave artistry. Their best-selling records of theme music from motion pictures (themes from “The Apartment” and “Exodus”) have made them widely popular, and this collection offers Ferrante and Teicher in a show-tune collection of uncommon interest. Four of the tunes are from Cole Porter’s score for Can-Can: I Love Paris, C’est magnifique, I Am in Love, Allez-vouz-en, Go Away. Richard Rogers and Oscar Hammerstein II are represented by four graceful songs from Me and Juliet: No Other Love, A Very Special Day, Marriage Type Love and I’m Your Girl. The Continental, from the movie The Gay Divorcee, was the first song to win an Academy Award; Con Conrad and Herb Magidson were the composers. Another Academy Award winner is The Last Time I Saw Paris by Oscar Hammerstein and Jerome Kern, heard in Lady Be Good, A Foggy Day was written by George and Ira Gershwin for Damsel in Distress, and Frank Loesser’s Wonderful Copenhagen was heard in Hans Christian Andersen. 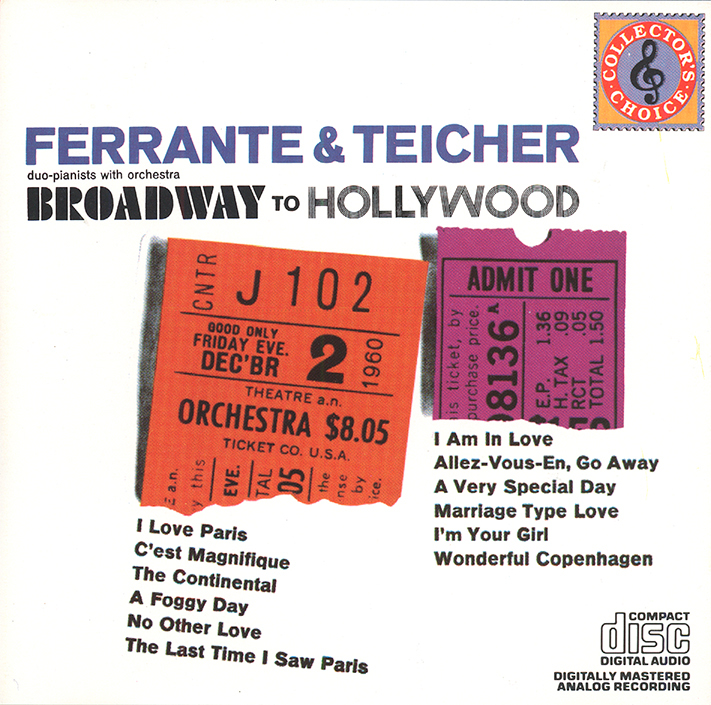 When I bought this CD in 1987, I knew very little about Ferrante & Teicher's history with various record labels. I was a bit surprised to find them on Columbia; I only knew of their United Artists and Bainbridge records. I was not pleased with the sound and shelved the CD for nearly 20 years. At the time, I couldn't understand why the recordings were so horrible. All the lush stereo strings with the reverb typical of Columbia recordings circa 1960, then in come the pianos in mono with tape hiss. What was that about? It turns out that shortly after F&T began charting at United Artists, Columbia decided to cash in on their success. However, instead of simply reissuing the Columbia albums Hi-Fireworks, Me and Juliet & Can-Can and Continental Holiday — which would have been legitimate — they butchered the recordings by adding an orchestra that had nothing to do with Ferrante & Teicher. My understanding is that F&T did take action to stop this but, apparently, were not successful. This 1961 Lp was reissued in the 1970s and finally on CD in 1987. Although I don't listen to it often, it was a delight to find the Collectables 2-on-1 reissue of Me and Juliet & Can-Can and Continental Holiday. Not only were my questions answered about the history of these recordings but I could hear them the way they Ferrante and Teicher intended. If you are simply a listener – and not a collector – of F&T recordings, buy the Collectables 2-on-1 and avoid this CD.